The facilities for research and development required an investment of AR$ 16 millions granted by CONICET and the Ministry of Science and Technology. The opening of the two new buildings of the Sante Fe CCT. Photo: CONICET Photography. 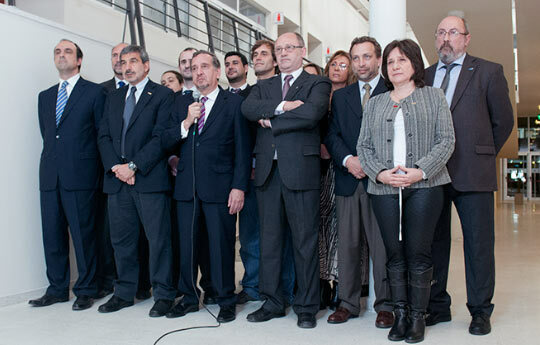 President Cristina Fernández de Kirchner inaugurated two new infrastructure works that will house more than 100 researchers, fellows, technicians and administrative staff of the Instituto de Agrobiotecnología del Litoral (IAL) and the Instituto de Matemática Aplicada del Litoral (IMAL). From the House of Government the head of State presented the new facilities through videoconferencing. The opening was attended by Dr. Lino Barañao, the Minister of Science, Technology and Productive Innovation, Dr. Roberto Salvarezza, president of the National Scientific and Technical Research Council (CONICET) and Dr. Albor Cantar, rector of the University of Litoral (UNL). During the event, the president recalled an old speech of minister Barañao and said, “at that time Argentina had a deficit of 130 thousand m2 to set the laboratories for all scientific and technological production, and a CONICET packed with researchers and fellows. That deficit was the result of 30 years of not doing anything, and today I want to tell that we are surpassed 155 thousand m2”, she concluded. For his part, the Minister of Science and Technology spoke about the view and orientation of the institutes of this centre and highlighted that “these institutes produce first-rate basic science in order to solve problems”. Besides, he added that in the case of the IAL and the IMAL “the institutes not only seek to acquire knowledge, but also to contribute to the economic development of the country”. During his speech, the president of CONICET highlighted the importance of the integration and said that “the personnel of these institutes worked in other facilities, separated, and today they have a common place where they can work and conduct their researches in really modern facilities”. Regarding the IAL, he added that “this institute has four researchers that came back from abroad, which evidences the ongoing policy of repatriating scientists that this government implemented throughout the years”. Dr. Raquel Chan, director of the Santa Fe Scientific and Technological Centre (CCT) and the IAL, and Dr. Pablo Manavella, member of the same institute and one of the repatriated researchers, talked to the president during the videoconferencing. With an investment of more than AR$ 16 millions, these two modern buildings are placed in an area of 30 hectares where the Santa Fe CCT and other CONICET institutes are also located. Founded in 2008, the Instituto de Agrobiotecnología del Litoral is of double dependency with the University of the Littoral (UNL). It has 1700 square meters and it required an investment of AR$ 13,000,000 approximately. Regarding the Instituto de Matemática Aplicada del Litoral (IMAL), it is also of double dependency with the UNL. It has 404 square metres and the cost of the work was AR$ 3,400,000. Part of money, 50 per cent, was financed by the Inter-American Development Bank (IDB) and the Ministry of Science, Technology and Productive Innovation; the rest was provided by CONICET. The videoconferencing was attended by Omar Perotti, national deputy; David Asteggiano, eng., State Secretary of Science, Technology and Innovation of Santa Fe; Dr. José Manuel Corral, the Mayor of the City of Santa Fe; Dr. Hugo Aimar, the IMAL director and vice-director of the Santa Fe CCT; and Dr. Bruno Bongioanni of the IMAL. Furthermore, some provincial deputies participated in the event. The new IAL building will be devoted to research development and technology in different scientific disciplines related to biotechnology applied to agricultural production, transfer of technology to the production sector, the supply of products and services for the society and the training of human resources specialized in plant biotechnology. Currently at the IAL work over 18 CONICET researchers, 6 UNL professors; 7 professionals, technicians and administrative staff; 23 CONICET fellows, two from FONCyT and 3 from UNL; 12 students who are working on their theses and other extra-curricular activities. In 2013 the IAL incorporated four repatriated researchers through the “Programa Raíces (Red de Argentinos Investigadores y Científicos en el Exterior)” of the Ministry of Science and Technology. The building has more than four half floors connected by ramps where there are 10 laboratories with 6 benches each, a central instrument laboratory, a microscopy laboratory, microbiology laboratory, four plant growth chambera, a washing room, 5 offices for group leaders and 10 more facilities for young researchers. Besides, it has a room for 80 people, a library, a multipurpose room and a hothouse. It was created with the idea of having common spaces that allow young researchers to use proper equipment for their lines of work. The institutes’ lines of research are focused on molecular mechanisms used by plants to adapt to adverse environmental conditions. Apart from the basic studies that lead to the understanding of these mechanisms, the IAL has developed genetic engineering technologies to breed plants of agronomic interest. These have been transferred to the productive sector for further development and commercialization. Besides, the institute has extensive experience in patent submission and transfer activities linked to agricultural activities. The Instituto de Matemática Aplicada del Litoral (IMAL) was built in 1977 based on the Applied Mathematics Programme (PEMA). Currently 22 researchers, 3 professionals and technicians and 17 fellows work at the institute. The new building has two floors and includes 19 rooms for researchers, two rooms with 8 posts each for fellows, a secretarial office, cabling, server, computing and multipurpose offices. In this institute researchers study harmonic analysis, differential equations, numerical analysis, inverse problems and statistics. The IMAL investigations are based on logic and number theory. Its objective is to advance on the main disciplines of mathematics, statistics and computer sciences through research and to contribute to the advancement of knowledge.